Can you get time off for good behavior, today? If so, watch the Good Behavior TV show pilot, below — now. TNT has released it online. Good Behavior officially premieres on TNT, Tuesday, November 15, 2016 at 9:00pm ET/PT. Michelle Dockery, Juan Diego Botto, Terry Kinney, and Lusia Strus star in the TV series adaptation of the Letty Dobesh novels by Wayward Pines author Blake Crouch. Showrunner Chad Hodge executive produces with Crouch, Marty Adelstein, and Becky Clements. 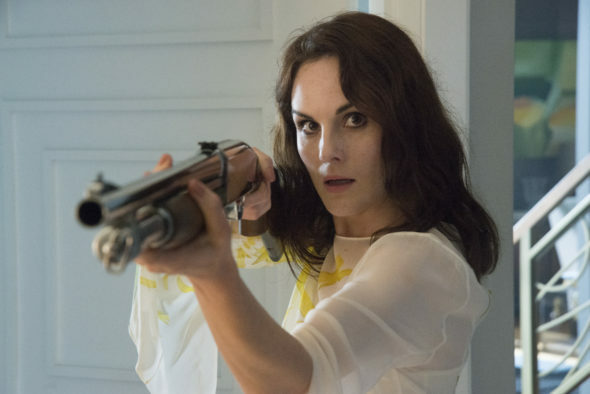 Watch the Good Behavior premiere, after the jump. Good Behavior follows Letty Dobesh (Dockery). A thief and con artist, Letty’s life is always a step away from imploding. And that’s exactly how she likes it. Fresh out of prison, Letty is trying to stay afloat. Her mother, Estelle (Strus) is currently raising Letty’s 10-year-old son. Letty wants to reunite with him. She must also stay in regular contact with her iffy substance abuse counselor, Christian (Kinney), whose motives are suspect. Good Behavior‘s November 15th linear premiere on TNT will also include the second episode. Check out the description from TNT. Did you watch the Good Behavior TV series pilot? What did you think of it? Will you tune in for season one on TNT? Let us know, below. More about: Good Behavior, Good Behavior: canceled or renewed?, TNT TV shows: canceled or renewed? absoloutely watched every show!! cant wait for season 2!! keep it going!!! LOVE LOVE LOVE THIS SHOW! I love this show I think it should go for another season!! Enjoying this series. Will there be a second season.? Well acted and totally intriguing. I luv this show. Definitely not like the usual run of the mill shows. I like the different background stories that explain each character’s personality. I wish it would have received more exposure. DITTO! I LOVE THIS SHOW TOO. Wonderfully acted by a talented cast who definitely has chemistry. Well written scripts. The plot is not so far-fetched as one might think when you consider that truth can often be stranger than fiction. I look forward to each new episode on Tuesday nights. I really hope that it gets renewed for a second season. I LOVE THIS SHOW& I discovered it on accident! It leaves me wanting more each week!